Sensors equipped in automobiles are becoming more accurate and more efficient in order to accomplish advanced regulation. These data are sent in analog method (voltage level and pulse modulation) to ECU but accuracy degradation in data transmission circuit from A/D conversion errors in ECU, increasing numbers of wire harness from multifunction sensors, increasing electromagnetic noise from motorization has been major issues. Recent years, in order to resolve these issues, a digital method SENT (Single Edge Nibble Transmission, SAE-J2716) communication is beginning to be used for high-accuracy sensors. Highly accurate and reliable data transmission can be achieved at low cost by using SENT communication equipped with error detection and capability to transmit highly accurate multiple data through single signal line. SENT communication is becoming rapidly popular in angle sensor used in steering and air flow sensors. 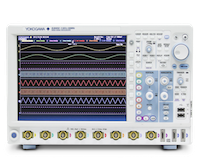 YOKOGAWA will support construction and verification of entire communication system and evaluation of single unit IC supporting SENT through DLM2000/DLM4000 and DL850EV. D/A converted SENT communication data can be trend monitored as an analog value using DL850EV's SENT monitor module. You can easily compare and verify with other analog signals in the same screen in addition to recording data by setting trigger in SENT trend waveform. It performs well with confirming consistency of SENT output value and amount of physical sensor input changes in production and development field. 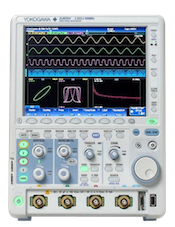 DLM2000/DLM4000 is able to analyze physical layer by observing SENT signal as a waveform (optional feature). Also, data decoding and triggering can be done and is ideal for troubleshooting in case such as SENT communication error due to noise effect. It can also display simple trend and list of decode results. *1. There is a limit in DLM2000's trigger function. Equipped with long memory. Import and analyze long period of time worth of SENT communication data. Fast CH(3CH), S&C, Slow CH(5CH), Error, Error Count (Integrated value of numbers of error) simultaneous waveform monitor. Simultaneous evaluation of multiple communication systems. Contributes to improvement of development efficiency.